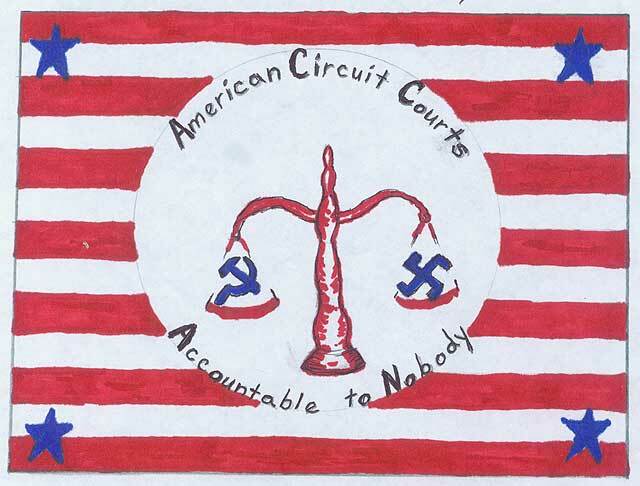 Is this a better design for the American Circuit Court flag? The Judicial Commission can only investigate a Judge if there is misconduct. If the Judge eliminates the State Statutes and rules by their own opinion of demands, there is no misconduct & therefore not accountable. No politician as of yet has stepped in on this corruption. They pass the responsibility or usually never reply. Nobody makes the Judge abide by the rules and therefore could resemble a Communistic Dictator. This Flag could hang above the U.S. Flag sice there is No American Authority that has power above or over the Circuit Court Judges. I hope it wasn't true!